This is a great synopsis of the Think & Grow Rich philosophy, by Napoleon Hill himself! Make no mistake about it, listening to and following the principles of Think & Grow Rich will help individuals in all walks of life achieve their goals. For instance, former heavyweight champion and International Boxing Hall of Fame Ken Norton credited his winning ways to Think & Grow Rich. Norton's victory over "The Greatest", Muhammad Ali, in 1973 is a great illustration of how individuals can beat the odds, achieve their goals, and reach their fullest potential using the principles contained in the motivational book Think & Grow Rich, a book that Norton discusses as a foundation for inspiration on the road to becoming a world champion. Norton also attributes what he learned from Think & Grow Rich for helping him to handle severe adversity from a near-fatal car accident in 1986. Individuals will accomplish their particular goal(s) in proportion to the effort they put into following the Think and Grow Rich philosophy. Listening to and following the principles in this book will change your life. Think & Grow Rich is one of the greatest self-help books ever. P.S. Another great book that Norton kept at hand on the road to becoming a world champion was Success Through a Positive Mental Attitude by Napoleon Hill and W. Clement Stone. P.P.S. One more excellent companion to Think & Grow Rich is Everything I Needed to Know About Success, I Learned in the Bible (And So Can You!). This book uses principles of success from the Bible and Think & Grow Rich. The ending gets repetitive and may even completely repeat previous sections. The repetition seems to be intentional for emphasis. This book I received it the first time in pdf as freebie for a program I purchased. When I realized I was able to listen to it from Napoleon himself I was so thrilled, his enthusiasm and care for the people are overtaking each time I listen to him. What a priviledge!!! Yes. It's a good foundation for someone trying to make real, lasting change in their lives. Don't be put off by the recordings being decades old. Most of the information can still be applied today. I've mentioned in previous reviews, there are motivational and personal development books. There are differences. Motivational will fire you up for a bit. Personal development will create lasting change. This program is more on the personal development side, which I enjoyed. 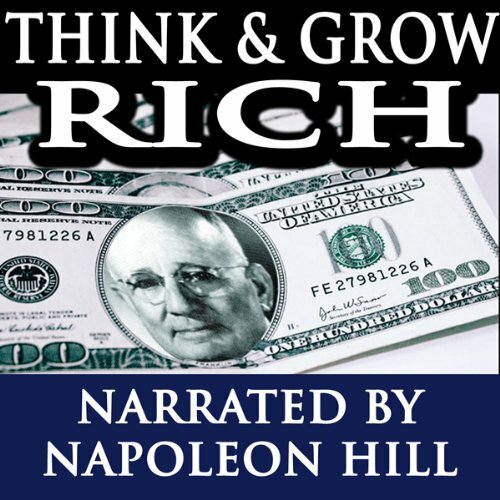 What was one of the most memorable moments of Think & Grow Rich - Lectures by Napoleon Hill? There wasn't any specific moment. Most of it is to the point and easy to understand. I can say I've always appreciated Mr. Hill's voice. I'm not sure everyone would agree with me. There's just something very engaging about it for me. What does Napoleon Hill bring to the story that you wouldn’t experience if you just read the book? I really couldn't say because I believe this presentation is only in audio form, with no book being available. But if I had to choose something, again, it would be his voice along with his very simple, succinct delivery. He rarely "wanders off." He just makes his points and moves along. What did you learn from Think & Grow Rich - Lectures by Napoleon Hill that you would use in your daily life? That it's not always about money. So many books, and even portions of Mr. Hill's publications, make money such an important goal. While I have no problem with others making that a target, it's just not for me. I appreciate using the information to improve my personal and professional lives. These are scratchy radio recordings that give you the nuts and bolts of the classic book straight from the mouth of the author. It's a little repetative in places, but the information is worth repeating. This book has never been about "making money." It's about finding success in all manner of your life by shifting the way you see yourself and the world around you. It's hard to argue with the likes of Carnegie, Edison, Ford, and so many countless others from whom Hill drew his research. All it takes is a willingness to look, consider the possibilities of those who have done it, and apply it. Application is what separates anyone else from the giants who changed the world. What you get out of it is directly related to what you put into it and how open you are to the material. I get a new insight from the book everytime I work through it, and this audio adds another layer to it. Must read for a successful life!!!!! The recording quality takes a little getting use to . However, the info is invaluable. Every parent should instill these values into there children. In their toolbox for success. ... which few will bother to attempt. Live boldly, or have a mediocre life. The choice is yours. I first read the book in 1977, when I was going through hard times. It totally changed my.mindset and life. I've read it several times since then, and have now listened to it.